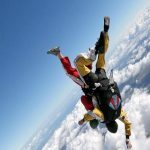 Skydiving clubs in Peterborough offers Tandem Skydiving and Accelerated Free Fall Skydiving courses at Peterborough. Raise money for charity and jump for free! Gift vouchers and corporate days are also available. 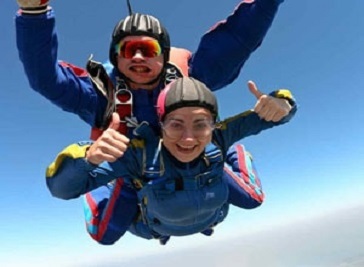 Run by BPA Skydiving Instructors, you can be sure you are in safe hands. Having received top class instruction you will exit the aircraft from an altitude of up to 13,000 feet securely strapped to the front of your instructor, who will control the free fall element of your tandem skydiving experience, open the parachute for you at around 5,000 feet, and then steer your parachute safely back to the landing area for a controlled landing. The clubs use only the very best equipment and instruction methods, with a safety record, and some courses can be completed in just one day, weather permitting. 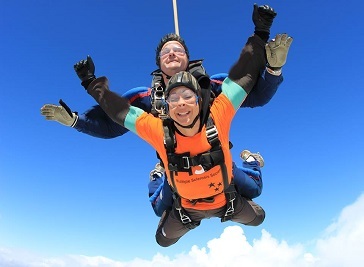 if you are planning to do a one-off jump for a charity that you support, we would recommend a tandem skydive as this gives the best all round experience of skydiving with the least amount of training. Make this a year to remember with a thrilling experience day! 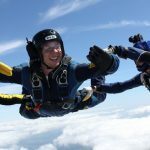 Here at the North London Skydiving Centre our tandem skydives near Peterborough will get your heart racing and adrenaline pumping. Offering you the chance of a lifetime, we guarantee that this is an experience that you will want do time and time again. It is one of only 23 British parachute Association approved skydiving centres in the UK so one can be sure one is dealing with people actually involved in the teaching of skydiving and its safety not an agency, operated by us as a nonprofit organisation.